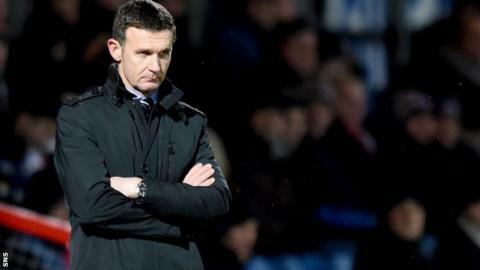 Ross County manager Jim McIntyre insists it is not a three-horse race at the foot of the Scottish Premiership to avoid relegation. Third-bottom Motherwell are eight points behind Partick Thistle, with County and St Mirren further adrift. "We are only coming up to the halfway stage," McIntyre told BBC Scotland. "So, for me, there's a lot of football to be played and there's too many points to be played for to say there are three teams in it." "There's about eight or nine games between now and the end of January and it's a crucial period." County scored a late equaliser against Motherwell on Saturday to lift themselves off the bottom of the table for the first time since the second game of the season. After the 2-2 draw, the Dingwall side are a point ahead of St Mirren but still two behind Well. "It was a tremendous boost," said McIntyre, who took over after the sacking of Derek Adams at the end of August. "It is what we've been working towards since we came in here. "We will try to take the next step and move up another place. "We know it's going to be difficult, as it has been difficult since we came in, but the hard work and effort and never-say-die attitude of the players to get that equaliser was fantastic." McIntyre does concede that games over the next month will probably dictate whether County will remain in a relegation battle or can challenge for a top-six place. "It's important that we just try to climb the table and see where that takes us," said McIntyre. "There's about eight or nine games between now and the end of January and it's a crucial period. "We've got to make sure we pick up as many points as we can in that period and try and get ourselves up to at least 10th place."